Bush Tours New Orleans, Promises Change President Bush visits New Orleans on the first anniversary of Hurricane Katrina hitting the city and the Gulf Coast. He toured parts of the city and met with local leaders. "We have got to give assurance to the citizens," Bush said, "that if there is another natural disaster, we will respond in better fashion." President Bush visits New Orleans on the first anniversary of Hurricane Katrina hitting the city and the Gulf Coast. He toured parts of the city and met with local leaders. "We have got to give assurance to the citizens," Bush said, "that if there is another natural disaster, we will respond in better fashion." One year ago today, Hurricane Katrina barreled to shore on the Gulf Coast, costing lives and bringing widespread devastation to Mississippi, Louisiana and Alabama. In New Orleans, levee breaks caused catastrophic flooding across much of the city and recovery has been painfully slow. Today, public officials and residents gathered to pray and to mourn the deaths as well as the losses. President Bush joined in some of the ceremonies. He has been sharply criticized for this handling of the storm and the rebuilding. But today he promised his administration has learned from its mistakes and he said it would address what went wrong. We'll have three reports. First, NPR's Audie Cornish was with the president in New Orleans. President Bush started his day at Betsy's Pancake House with a short stack and a promise. Waitress Joyce Labruzzo asked Mr. President, are you going to turn your back on me? No, ma'am, Mr. Bush laughed and paused. Not again. This time last year Labruzzo's restaurant and 80 percent of the city was under water. CORNISH: By the time bells tolled to commemorate the breaking of the levees, the president and Mrs. Bush were in the front row of the St. Louis cathedral. CORNISH: Among those participating in the service was U.S. Army Lieutenant General Russell Honore, who directed federal troops in the relief effort. Today he read from the Bible's book of Lamentations. Lieutenant General RUSSELL HONORE (U.S. Army): Remembering it over and over, leave my soul downcast within me. But I will call this to mind as my reason to have hope. CORNISH: After the service Mr. Bush visited a mid-city neighborhood, where the patchwork of trailers and damaged homes is emblematic of the city's condition. There the president and the first lady toured Warren Easton Senior High School, which got federal dollars to restock its library but has delayed reopening as repairs continue. Speaking in the school's auditorium, Mr. Bush took responsibility for the federal government's response to the storm. President GEORGE W. BUSH: Every department of my administration has looked at its response to last year's hurricanes and has recommended practical reforms, things to do to make sure that the response is better. CORNISH: Many in the crowd had driven in from suburbs such as Kenner and Mederi. They applauded the president's message of rebirth and self-sufficiency. President BUSH: The federal government is working with the Louisiana Recovery Authority to help people get back in their homes and we've appropriated more than $10 billion to help people achieve that dream. CORNISH: Some of that federal money is just now reaching a handful of Louisiana citizens this week as the state gets its Road Home Recovery Grant Program underway. President BUSH: New Orleans is calling her children home. I hear it from all of the local officials. They say they've got a plan in place and money coming to make New Orleans a hospitable place. CORNISH: The population here is less than half the 480,000 who lived here before Katrina, but New Orleans has always been a city that knows how to be hospitable and its residents were showing how again today with anniversary events of their own. CORNISH: From neighborhood potlucks to roundtable discussions and those signature jazz processions that could only happen in one place. Will Bush's Peak and Low Point Be Reversed? 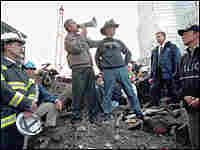 President Bush speaks to rescue workers, firefighters and police officers from the rubble of Ground Zero on Sept. 14, 2001, in New York City. 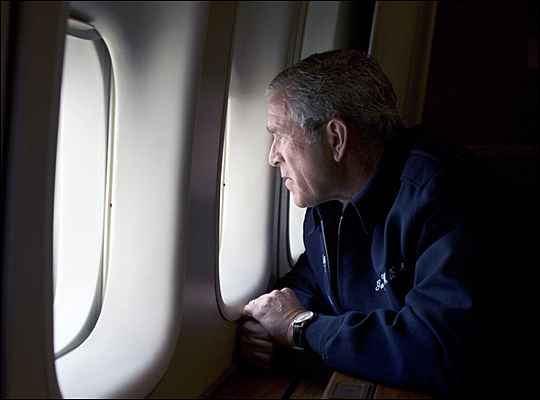 President Bush looks out over the devastation from Hurricane Katrina as he heads back to Washington, D.C., Aug. 31, 2005, aboard Air Force One. Two notable anniversaries mean two weeks of highly predictable media frenzy are upon us. Many days of remembering Hurricane Katrina will give way to even more days of recalling the terrorist attacks of Sept. 11, 2001. In this long fortnight of reflection, we will hear 9/11 described as the zenith of Bush's presidency -- Katrina as the nadir. Many will say the president's resolute response to 9/11 revealed the man at his best, while his failure to grasp the disaster in New Orleans exposed him at his weakest. Such notions are hard to deny with respect to the first hours or days of these disparate crises. But as days become years, the federal government's long-term response to Katrina may well achieve more good than the Bush administration's long-term response to 9/11. However tempting it may be now to call 9/11 the president's finest moment -- and Katrina the opposite -- history may well reverse both judgments. Let us first consider the case of the 9/11 response. In the media, it seemed heroic. 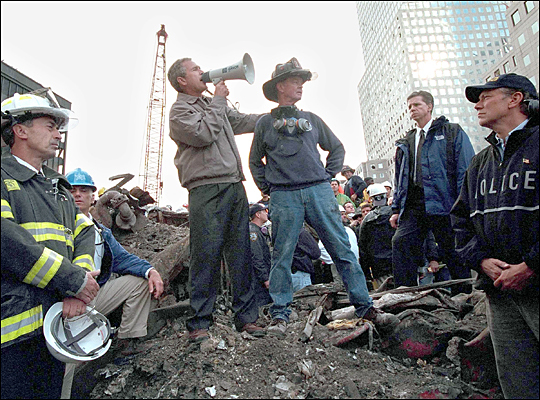 All of us can picture the president with a bullhorn at Ground Zero. We can see him standing before the Congress and the nation a few days later. Both times his words were simple, direct and ringing with reassurance. Words were followed by deeds. Within a few weeks, an expeditionary force was making good on an ultimatum the Bush administration issued to the Taliban government, which had harbored al-Qaida in Afghanistan. That regime was soon overthrown, and in the ensuing months, the country moved toward democracy and social liberalization. President Bush and Vice President Cheney often cited Afghanistan as a success story. As the months became years, however, the situation in Afghanistan got shakier. As U.S. forces left and international peacekeepers arrived, a resurgent Taliban began making inroads again. It's hard to know who will hold Kabul in 2010 or beyond. Meanwhile, the Bush-Cheney post-9/11 doctrine of pre-emptive defense had moved on into Iraq. The connection between al-Qaida and the regime of Saddam Hussein was less than clear, but it made its way into many administration speeches nonetheless. To bolster the case for an invasion, the White House also pressed allegations that Saddam had or would soon have weapons of mass destruction. In the election season of autumn 2002, Congress felt the pressure and went along. The following spring, the United States invaded and toppled Saddam. For a brief period, it appeared to be another success story. But over the past three years, Iraq has proven far more daunting a challenge than the White House expected. Insurgents loyal to Saddam fought on after his fall. Tensions between Iraq's religious and ethnic factions led to sectarian violence and then to the verge of civil war. American forces suffered casualties: more than 2,600 dead and several times that number severely wounded. Iraqis have died by the tens of thousands and continue to die at a rate of 2,000 a month in Baghdad alone. Now President Bush says U.S. forces will not leave Iraq so long as he is president, implying they may need to remain far longer. And the dream of spreading democracy throughout the Middle East seems no closer to fruition. What will be the legacy of this policy in 2010 and beyond? Now let us consider the quite different trajectory of administration policy on the Gulf Coast. This time, things began badly. In the media, the Katrina response was as much a disaster as the 9/11 response was a triumph. Even after the storm struck and the levees broke, the president seemed reluctant to leave vacation mode. 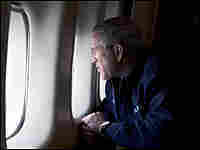 We saw an impassive president gazing out a window on Air Force One, thousands of feet above the devastation. Soon the world saw thousands of human beings marooned and bereft in New Orleans and elsewhere. Deep doubts shrouded government at all levels, not sparing the White House. Congressional hearings were held that pounded presidential minions from Homeland Security and the Federal Emergency Management Agency (FEMA). The president's approval ratings drooped into the low 40s, then dropped into the low 30s. Although gas prices, Iraq and other issues contributed, Katrina was the blow that sent this president reeling. He has yet to recover, and staff shakeups have been only partially successful at righting the ship. Yet this is where the Katrina trajectory should start curving upward. The prospects for the Gulf Coast's recovery are good, if guarded, for now. The federal wheels grind slowly, but more than $110 billion has been committed so far, and about $77 billion has been paid out. And while some of this has been wasted, much has had substantial effect. As the president himself has highlighted, much of Mississippi's storm-ravaged area is coming back after just one year. In time, and with sadness, New Orleans too will be rebuilt. It will be smaller, more compact and more defensible. There will be less residential acreage as the least habitable, lowest-lying areas are abandoned. Once restored, the levees should be more reliable. Future efforts to prevent flooding and encourage timely evacuation are likely to be taken more seriously than in the past. Some even believe the city may enjoy a new era of comparatively clean, responsible government. And in any event, few doubt that the indomitable spirit of New Orleans will return. So, by the year 2010 or beyond, the trajectory of federal policy in this area will have brought positive results. And in that, it will contrast sharply with the policies adopted in response to 9/11. Maybe the president soared when the tall towers of the World Trade Center came down, and maybe he sank when the waters around New Orleans rose. But in each instance, that was only the beginning. And in each instance, those of us who witness the later chapters may see quite a different story unfold. Ron Elving co-hosts It's All Politics, a weekly podcast, with NPR Political Editor Ken Rudin.